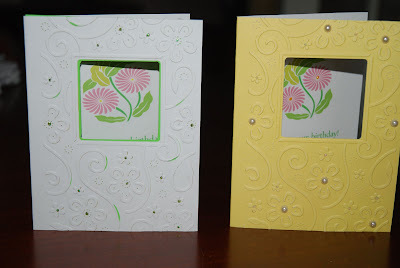 I recently purchased two of the new Cuttlebug Plus (embossing and cutting) folders and decided to try my hand at making quick cards for friends and family. 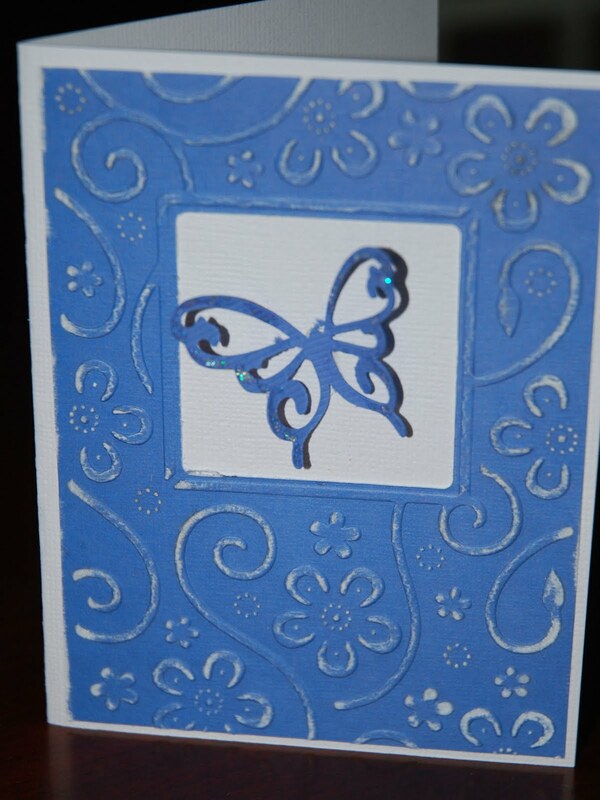 The first card -- blue with the butterfly cut-out on the filled center window -- is a birthday card. 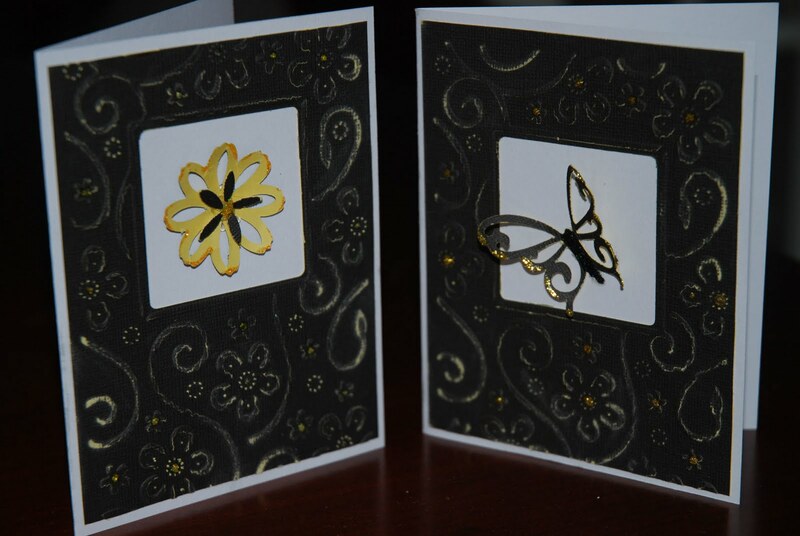 Plain and simple, this card uses Provo Craf t's "Perfect Perennials" Embossing Plus folder, shown here at left. As you can see, the center square image is cut from the card, leaving the open window. 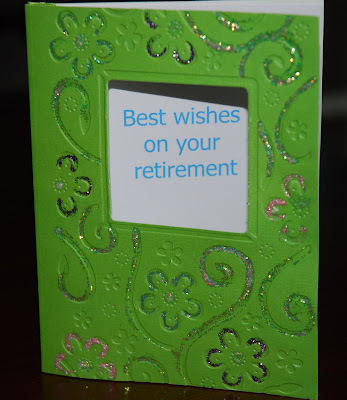 In the case of this card, I glued the embossed image onto an A2 premade card. For the inside, I printed a simple "Happy Birthday" message in a coordinated blue color. Incidentally, I used a Core-dinations paper (blue over white) and buffed the surface with a Tim Holtz sanding block. 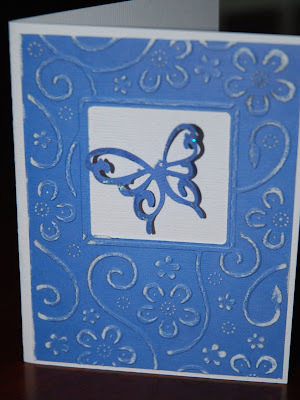 The butterfly was cut from Cricut's new "Cake Basics" cartridge, and was decorated with Stickles. I glued the butterfly to the white window shade using hot glue so it would really stick when I lifted the wings to give the butterfly dimension. Here are two cards I made using the same folder. With these, I left the window open (no shade). 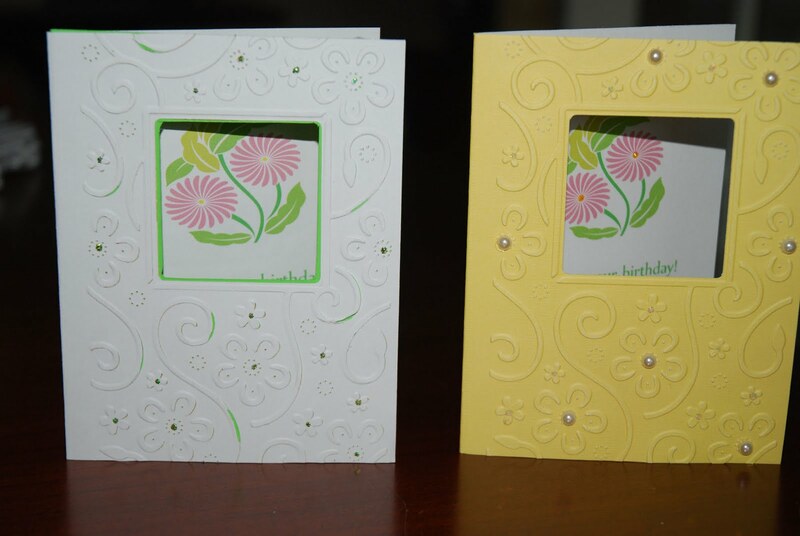 Because my white paper stock was thinner than the yellow, some of the embossed swirls cut through the paper. Instead of trashing it, I backed it with a coordinating spring green paper and cut through and removed random swirl pieces. I decorated the flowers using Stickles. For the yellow at right, simple adhesive pears accented each of the larger flowers. I returned to the Core-dinations paper -- this time, black over yellow -- to make these two sympathy cards. 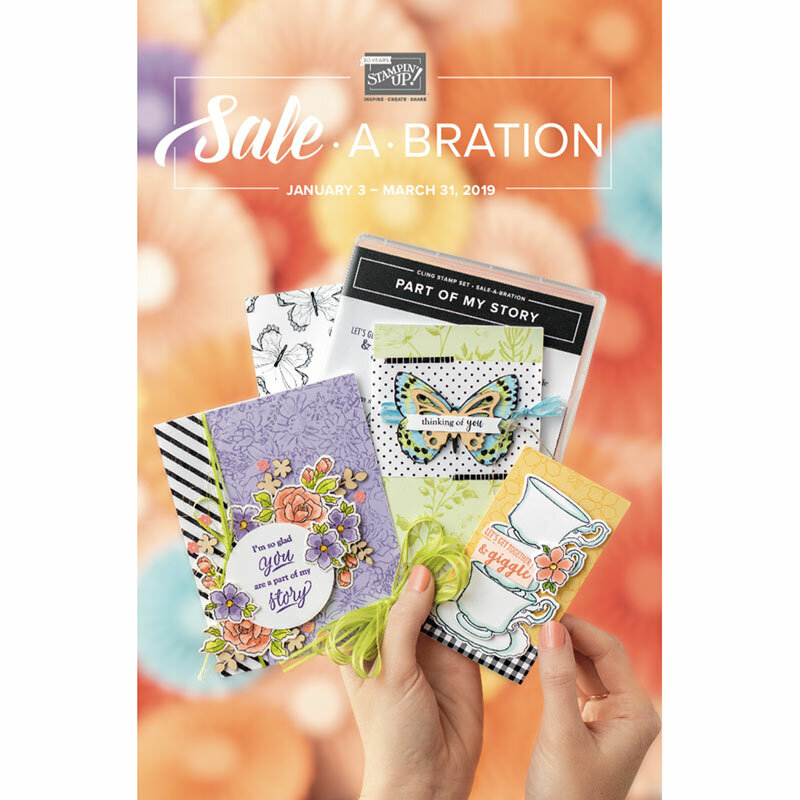 Each is printed inside with a caring message. A flower and butterfly adorn the closed shade in the window. 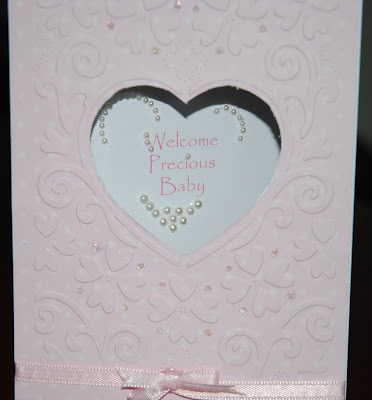 Finally, I used Cricut's "He Loves Me" Cuttlebug Plus plate (shown here) to make the Welcome Baby card below. One last card -- kind of a mistake if you will. I wasn't careful on arranging my A2 card on the embossing plate, so the image was "debossed" instead of embossed. First, I threw out the card as a reject. Then I decided to color in the debossed areas using multi-color Stickles. A printed "Best Wishes on Your Retirement" message was included. best friend Star, to donate my Cuttlebug to her craft tool collection. More cards coming soon, to a blogsite near you! Great ideas. Thanks. 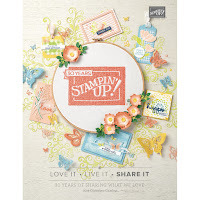 Have you had success doing the embossing plus sets in your Cuttlebug. I have not been successful. Help!